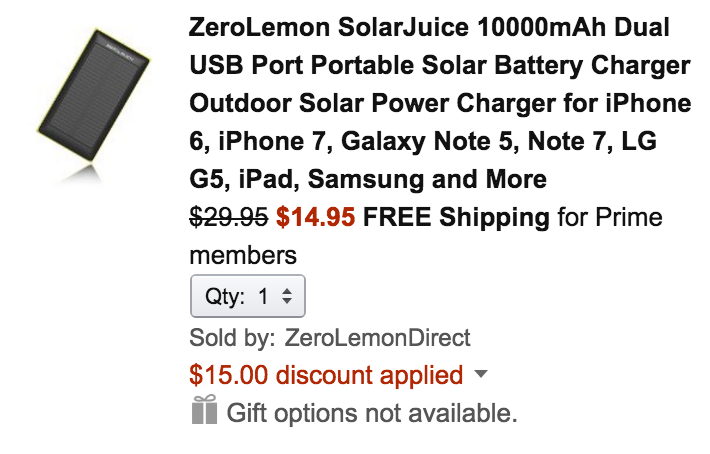 ZeroLemonDirect (100% positive feedback all-time) via Amazon offers a pair of its popular Solar Portable Battery Packs at low prices. The 10000mAh model goes to $14.95 Prime shipped (Reg. $30) with code 65KNZSK5 while the larger 20000mAh is on sale for $21.99 Prime shipped (Reg. $40) when promo code FDVKSXUP is applied at checkout. That’s good for up to 50% off the regular price and the best that we’ve tracked. These dual-port power supplies are great for working outdoors, traveling or just hanging out. There are 2.1 and 1A outputs for charging a tablet or smartphone and a built-in LED light for emergencies. Each model is rated 4.2/5 stars by nearly 550 Amazon reviewers.